Synopsis: Have you ever been told to introduce yourself to a group of strangers? If so, most of us begin with two things: who we are and what we do….as if our profession is inextricably attached to our person. This is the struggle that many of us face. Since we don’t know who we are outside of the roles we perform, we end up auditioning every day of our lives on a stage that wasn’t meant to define us. We end up seeking, in unhealthy ways, approval, self-worth and affirmation. We place more emphasis on the work we do, or the money we make, or the house we own, than the purpose for which we exist. But, Born Identity will give you insight into the deeper parts of you that you’ve yet to discover. 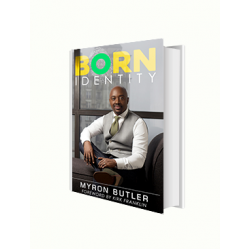 Rather than defining yourself by the external, author Myron Butler will journey with you into the core of your heart, and help you to unearth the truth of who you are, from God’s point of view. Bio: One of the most exciting and influential young voices in modern gospel music, Myron Butler is making a name for himself as a singer, songwriter, producer, and now author. Myron Butler has enjoyed massive gospel radio hits with “Set Me Free” and “Stronger.” The success has led to Stellar Awards, Grammy nominations and a reputation as one of the most in-demand men in gospel today. Butler serves as the Minister of Music at Bishop T.D. Jakes’ Potter’s House Church in Dallas, TX that enjoys a congregation of 30,000 people. He and his wife, Timberlyn, reside outside of Dallas with their three children.